I don't think I'll be reading the third book in the series. Heidi is entirely too frustrating for my liking. There are times in the book where you want to shout DO SOMETHING, YOU IDIOT.The problem with Leigh Evans work is that you are not sure until the end whether you like the book or not. You would think being a half were and a half fae Heidi would be amazing but she is NOT. She is more of a thinker and less of a doer. You have to wait till the end for her to take action and by that time you are so angry with her that you don't even care what she does. 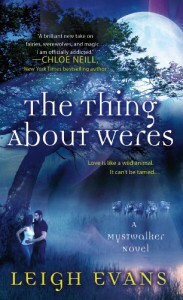 Giving 3 stars to The Thing About Weres is my version of being generous.